Kick off your visit on the 8th (Sat): browse the exhibits of Maritime Museum of San Diego. For traveler tips, more things to do, and more tourist information, you can read our San Diego trip itinerary builder tool . London, UK to San Diego is an approximately 14-hour flight. You can also do a combination of flight and train. Traveling from London to San Diego, you'll gain 8 hours due to the time zone difference. In December, San Diego is a bit warmer than London - with highs of 23°C and lows of 12°C. Finish your sightseeing early on the 9th (Sun) so you can drive to Los Angeles. Kick off your visit on the 10th (Mon): find something for the whole family at Disneyland Park. Get ready for a full day of sightseeing on the 11th (Tue): examine the collection at The Getty Center, partake in some friendly competition at Fantastic Race, and then see the sky in a new way at Griffith Observatory. To find more things to do, maps, reviews, and tourist information, go to the Los Angeles travel planner. You can drive from San Diego to Los Angeles in 2.5 hours. Alternatively, you can take a bus; or fly. Expect a daytime high around 24°C in December, and nighttime lows around 11°C. Cap off your sightseeing on the 11th (Tue) early enough to travel to San Francisco. San Francisco is known for nature, museums, parks, nightlife, and shopping. Your plan includes some of its best attractions: take in the views from Golden Gate Bridge, take in nature's colorful creations at Japanese Tea Garden, tour the pleasant surroundings at Golden Gate Park, and take a memorable ride with Cable Cars. 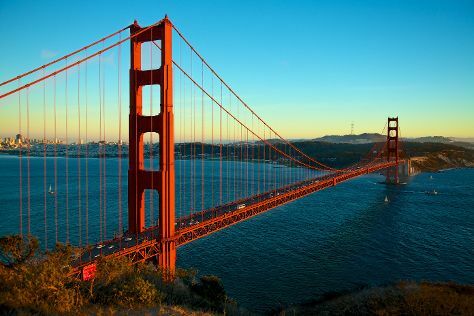 For photos, more things to do, reviews, and tourist information, you can read our San Francisco trip itinerary builder . Traveling by combination of train and flight from Los Angeles to San Francisco takes 4.5 hours. Alternatively, you can do a combination of train, flight, and subway; or drive. Traveling from Los Angeles in December, you will find days in San Francisco are little chillier (17°C), and nights are about the same (8°C). Finish up your sightseeing early on the 14th (Fri) so you can travel back home.